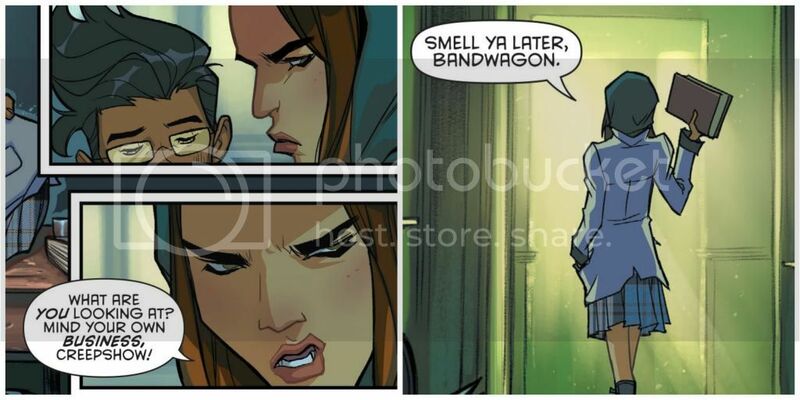 It’s always hard to follow up an impressive first issue, but Gotham Academy does it well. 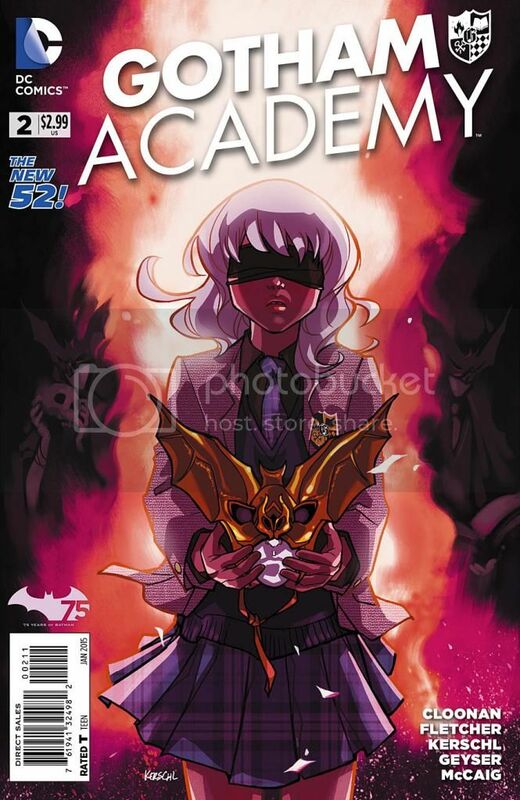 This issue follows Olive Silverlock, who continues to struggle to fit in at Gotham Academy. She’s isolated in class and ostracized in the lunchroom. Pomeline Fritch is fleshed out better as the main antagonist/foil to Olive. We meet Heathcliff, Pom’s current boytoy whom Olive tutored in the past. I like the authentic adolescent dynamic of Pomeline trying to intimidate Olive and put her in her place. Pomeline’s weapon of choice is to attack Olive about two things: something that happened over the summer, and her mother. We don’t get the reveal yet of what’s going on with either, but we can infer. Something gossip-worthy happened to Olive over summer break, which leaves her feeling a lot of shame and alienation. She’s even afraid that her relationship with Kyle was impacted by it. The only person who’s attempting to console Olive is a teacher, Professor MacPherson. Professor MacPherson could have been a trope of a crabby, sexless teacher, but I like how Becky Cloonan and Brenden Fletcher write her as a slightly deeper character. Professor MacPherson is not afraid to make Olive and Pomeline do the hard thing and get along enough to work on a group project. Professor MacPherson also smokes, has a dog named Ham (I’m guessing that’s short for Hamlet), and takes time out of her smoke break to sit down with Olive and talk about life. I bet a lot of readers of this issue can think of times they’ve felt alienated, and can think of teachers who went out of their way to make them feel valued and heard. Cloonan and Fletcher are slipping in a small homage to teachers who care, and I appreciate reading it. Along with Heathcliff and Professor MacPherson, Cloonan and Fletcher are rounding out this Gotham Hogwarts with a few other mysterious characters. There’s a secretive artist who sketches a picture of Maps in his notebook. There’s a librarian whom we feel there is more to than meets than eye. Best of all, Kyle speaks! He says exactly two lines. If Gotham Academy were completely textless, I would still read it for the incredible colors by Geyser, McCaig, and Rauch. I can’t wait to find out what went wrong between Olive and Kyle. I’m excited for Maps to have more interactions with other students — has she made any friends yet? Cloonan and Fletcher have sucked us into their world of mystery, and I’m enjoying every panel.